The late-night offerings at Momi Nonmi, Chris Chung’s Japanese-Hawaiian izakaya tongue twister, sparkle with invention, polish, and puckish wit. They also sparkle with caviar—in the form of a recurring special of tuna belly tartare ($25) punched up with habanero and soy and packed into half a repurposed caviar tin, the other half striped with white yam, black roe, green scallion, and persimmon purée. 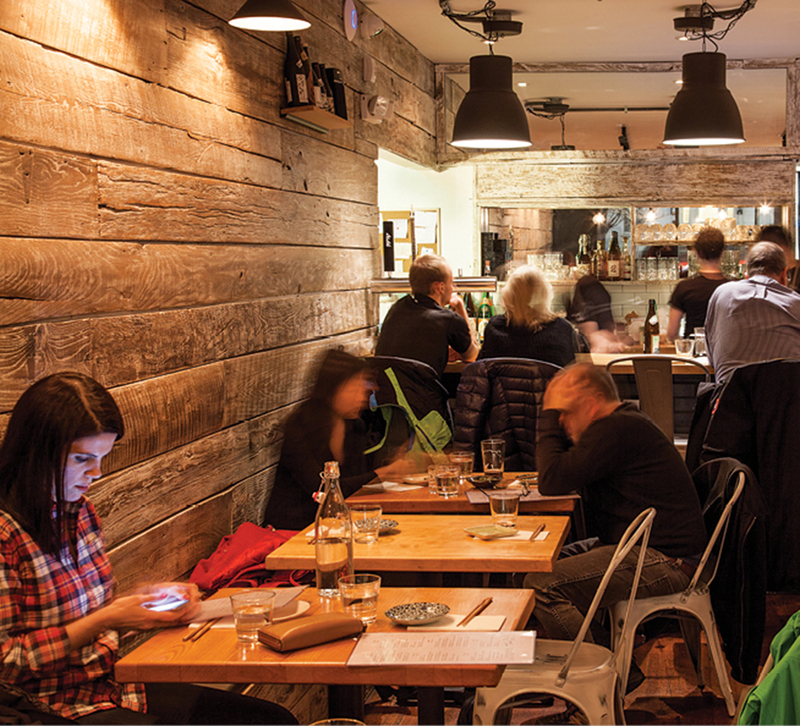 Other after-hours cameos have included yuzu kosho–glazed duck drumettes ($8), yolk-moistened chicken tsukune meatballs ($5), and house-made Spam harnessed tight atop a rice mound with a nori strap ($6). 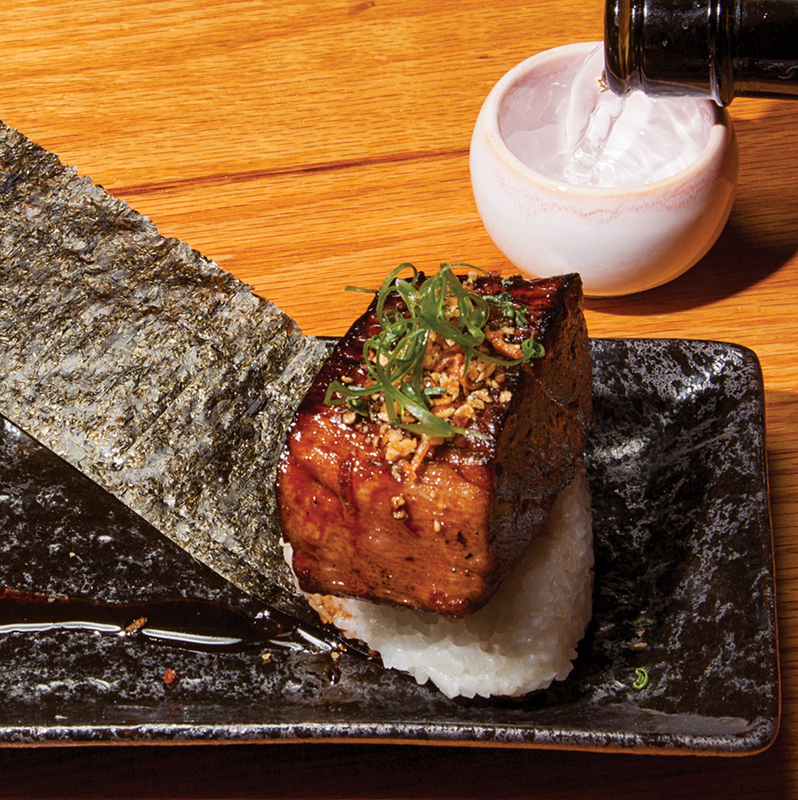 This is drinking sustenance—just the potent flavors and rib-sticking ballast you want for a night spent over-fiending on shochu, sake, whiskey, and cocktails of the caliber proffered by sommelier Stephen Connolly, Momi Nonmi’s resident rice-wine wunderkind. In Boston, we associate the term izakaya with the wallet-lightening likes of O Ya and Pabu or the mad-camp psychedelia of Hojoko. But anyone who’s gallivanted around Tokyo’s outer neighborhoods lately will recognize in Chung’s wee-hours gambit (Thursday through Saturday only, 10 p.m. to 12:30 a.m.) a more classic exemplar of the genre in its modern, chef-driven form. Here’s the thing: During regular dinner service, when most diners will experience it, Momi Nonmi felt like a different restaurant. A lesser restaurant, if I’m being straight up. Flavors skewed timid and understated—as though reverse-engineered to play soft-spoken companion to Connolly’s daiginjos rather than counterpunching drinking buddy. Momi Nonmi also goes (almost) all in on a gluten-free theme that, while laudable in theory, in practice tended to gum up the works. If you’ve been following Chung’s career, you’re likely surprised to hear the word “timid” associated with this seasoned rock star of local Japanese cuisine. The Hawaii native was among the first chefs tapped by Ken Oringer to run Uni, back when it was but an haute-sashimi side hustle tucked into Clio. By the end of the aughts, Chung had moved to Lincoln to open, with chef Christian Touche, Aka Bistro—a dual-fuel concept featuring half brasserie-inspired French, half Uni-level Japanese that had sushi scenesters making pilgrimages up Route 2. After Aka closed in 2016, I lost track until I spotted him back at Uni, now newly expanded, under executive chef Tony Messina—who first cut his teeth in the world of rarefied raw fish in 2008, when (wait for it) Chung trained him at Aka. In other words, Chung groupies (myself included) have been stoked for this solo album to drop. Now it’s out and it’s… an odd bird. Don’t get me wrong. There are terrific songs. But there are tracks I suspect won’t end up on your Most Played list. The sashimi, unsurprisingly, was the regular menu’s strong suit. Translucent-white swaths of raw branzino ($12) were lavished with soy sauce slow-simmered with aromatic jalapeño, ginger, and sake, and punctuated by staccato bursts of pickled burdock root. Bold yet nuanced, it was the best dish I tried—at any time of day. Chung’s Uni Cup special ($24) was plumped up with so much of the blob stuff it was like a stadium-rock cover of his alma mater’s famous Uni Spoon. By contrast, sea bream sashimi ($16), briefly aged to develop umami undertones, then seasoned gently with tea-smoked ponzu, was so subtle it barely registered. Live-scallop sashimi ($16) dressed in black garlic, pickled cauliflower, and truffle vinaigrette tasted dissonant and sharp, bringing out the mollusk’s coppery notes in unpleasant ways. Cooked offerings continued the hits-and-misses parade. Edamame croquettes ($6) bulked up with potato were pleasant but needed more salt, more fat, more yuzu kosho pizzazz. Duck confit onigiri ($12), drizzled with chocolate kabayaki sauce on a rice mound meant to be wrapped in nori, practically pleaded for a hit of (culinary) acid. It was also sized weirdly—too large for grazing, too unwieldy to share. 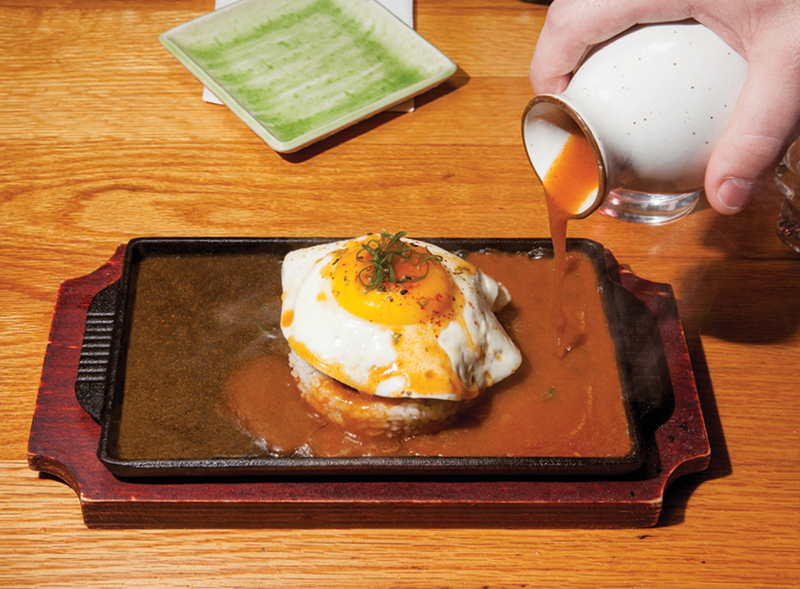 When the Instagram-courting teppanyaki loco moco ($16)—a grass-fed beef patty on rice with a fried egg, all on a sizzling platter—hit the table, we breathed a sigh of relief. Finally, some comfort food! Here again, the kitchen erred on the lean-and-clean side, eschewing the butter, salt, roux-bolstered gravy, and corn-fed naughtiness that make this dish Hawaii’s official hangover cure. Which brings us to the gluten-free tempura. Rock shrimp ($15) with togarashi, chives, and saffron aioli was better than the salmon ($10) and veggie ($10), but all three versions lacked the shattering lightness traditional recipes yield. Rice-flour okonomiyaki ($16), a savory stuffed pancake that normally trades on snappy textural contrast, was pasty and mushy, sandbagged by the moisture of grated yam and cabbage. I don’t know if Chung has chosen this angle because of personal diet concerns, as a business stratagem, both, or neither. In fact, I deliberately didn’t ask. Art, culinary or otherwise, must stand on its own. On my last visit to Momi Nonmi, most of the 25-seat dining room had been commandeered by a party of 12… or 13, if you count the snoozing German shepherd sporting a service-animal vest two sizes too small, sprawled out under their table and halfway under ours. “It’s an allergy table,” my date stage-whispered. “Sesame… and soy.” Jesus! What the hell were they even going to eat? I made a mental note to grade service on a curve. But our ace servers remained unflappable. As the chattering baker’s dozen feasted on unsauced sashimi and low-congener sake, we enjoyed an impeccably paced meal. The ability to customize the dining experience on the fly is, they say, the highest form of hospitality. There’s something to that. On this front, Momi Nonmi knocks it out of the park. But there’s a corollary to that truism: If you try to please everyone—the medically allergic, the fashionably averse, the late-night reveler, the wheat-seeking critic… even, perhaps, the sake savant—there’s a risk of diluting what you are.